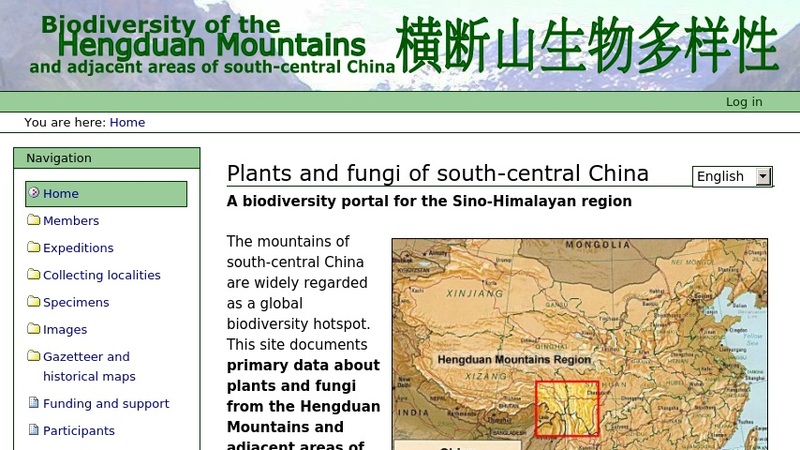 This site provides data on plants and fungi from the Hengduan Mountains and adjacent areas of south-central China, including the Gaoligong Mountains and Tibetan Himalaya. The data were derived from georeferenced collections made on recent expeditions (1984-present) to the region, and include specimens with DNA tissue. Users can browse specimens by name; search by taxon, collector number, or date; or browse collecting localities in the database using Google Earth (TM). There is also information on expeditions and personnel, the Biodiversity of the Eastern Himalaya project, an image gallery, a multilingual gazetteer and thesaurus, and a map showing the historic Tibetan provinces of the region.